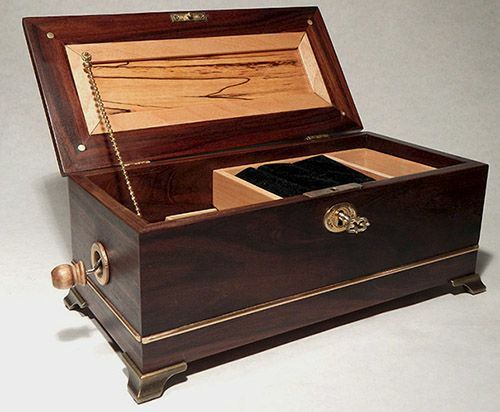 This is not only a jewelry box, but a music box too. Made for a client's daughter, with the mechanical device provided by the client and thus becoming the foundation for this project. Working closely with the client, something I always try to do, we both came up with the "needs" for this box. I always try to show a client photo samples of wood combination along with any hardware that is needed. This gives both of us a solid direction to proceed creating a box we both enjoy. I think this worked out extremely well. 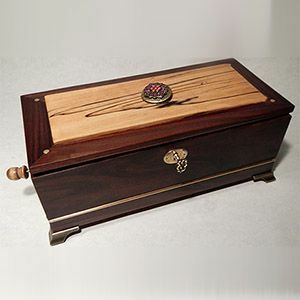 The woods used: box body and lid frame are Bolivian Rosewood, an uncommon wood, at least to me. Not as red as most other "Rosewood" species, but with similar grain pattern, although muted, this book feels more classic. Brass rod, only partially inset wraps the box body and is complemented by a classic set of brass "feet" complete with hidden felt dots to prevent scratching any surfaces. Brass rods have been used to strengthen the lid frame and a brass mortice lock and key hole escutcheon also compliment the brass highlights of the box. 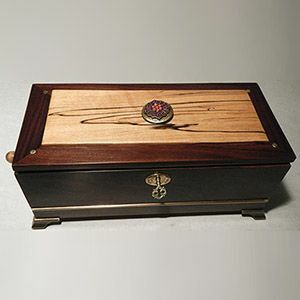 The inset part of the lid is Spalted Maple, a much lighter tone with very distinct "wild" grain, capping off the box as a whole and softens the classical feeling of the box. All trays and the ring holder device are black suede, setting off the maple construction of the divider trays, which are removable. This project was a bit different for me, like overcoming the inclusion of the music mechanism and finding the correct detail to become part of the box accommodating the hole for the musical crank. And top (pun intended) a locket was inset into the top to enable the client to insert his daughter's picture, making this musicial jewelry box a "keepsake" one too.